Giggles and Chatterbox-ing | Our family's adventures in fostering, Autism and ADHD. Chatterbox’s OT made her a weighted blanket for her bed and a weighted lap mat for school. The only problem was that when Chatterbox sat with her legs crossed the lap mat wasn’t quite long enough to go over her legs and so it wasn’t as effective as it should have been. I didn’t know this until her teacher bought it up and so I offered to make it a bit longer. While stewing over how to keep the rocks in their own sections, and not all over the floor, while I was trying to sew the mat up I realised that this would be a perfect job for odd socks! Odd socks to the rescue once again! Step 1 Measure the person’s lap when sitting on the floor with their legs crossed. I used a bit of string to measure as it is flexible enough to accurately sit on the lap and it’s not a situation where you need exact measurements. Cut a big rectangle of material that is this long. I’m all about taking the easy way out so I made my material twice as wide as I wanted the finished product so that I had one less hem to sew! Step 2 Fold the material in half and lay the odd socks on top – this is where you will discover how many socks you need for your lap mat. Chop of the tops (leaving the foot section) so that they will fit when fully sewed. Unfold the material and pin the socks down with the toes towards the middle of the material. Step 3 Sew the toe ends onto the material. Step 4 Carefully put even amounts of rocks into each sock and pin top of sock down. Step 6 Sew two of the open sides of the mat closed. Step 7 Turn mat in the right way, fold the hem of the open end in and sew closed. Step 8 Marvel in how much money you have just saved yourself by making a weighted lap mat with odd socks. In the last month Chatterbox has completed a week long Occupational therapy intensive, followed by Speech therapy and Occupational therapy three times a week. A total of 19 hours of therapy, on 16 separate days. A grand total of $3634.50! Thankfully we didn’t pay for it! We got funding through the Government’s “helping children with autism” program. Chatterbox was over 6 when she was diagnosed so we had to apply for special consideration to get the funding. We were granted that but weren’t granted any more time to use it meaning that we had $6000 dollars to use in the first half of the year (we did 3 hours of therapy a fortnight) and then another $6000 to use in five weeks from the start of this financial year before Chatterbox turns 7. On top of the actual therapy time there was 1293.6kms worth of driving and at least 23 hours in the car! And now we are done. Well not completely done – we are back to one day a week with therapy, but I am so grateful for that. Now I can use some of the time I was using for therapy on catching up on my uni work! Sorry it’s been so quiet around here lately. While waiting for Chatterbox’s ADHD meds to be approved by the fostering agency we were dealing with a lot of behavioural issues. They managed to approve it two days before the end of school term. Last week we went away for a few days and this week we have been doing two hours of Occupational Therapy each day at the Sensory Gym. The problem is that it isn’t two hours in a row – it’s two separate hours with a three and a half hour break in the middle. We live too far away to come back home for the break which means that we were out all day. As I mentioned earlier we went away last week for a few days. Going away now isn’t the same as going away before Chatterbox went for her night time walk. Before when we went away we were cautious about security and looked doors where we could, but didn’t worry too much. Occasionally we would move furniture and put it in front of the door so she couldn’t open it without making a noise. This is what we did the very first time we went away. That first holiday was while the kids were still only with us for respite and we went to the beach for my sister’s wedding. We moved the dining table in front of the door. Eventually, as Chatterbox started telling us that she would never run away from us, and as she wasn’t attempting it, we relaxed and enjoyed out holidays. Last week was the first time we have stayed anywhere overnight other than home since the night after the ‘walk’, and we went away with my parents and Aunty. We made lots of plans. To start with we had to look for somewhere that was single story – just in case the bedrooms were too far away from each other on different floors and we wouldn’t be able to hear Chatterbox. We planned what to take so that we knew if she was out of her room, or got out of the house. On our way away we bought new door alarms as we had one and I wanted more. We took our ‘buzzer’ and our pressure mat. When we got there we put door alarms on the back door as well as Chatterbox’s bedroom door. We put an alarm on the window in Chatterbox’s room. We put the buzzer sensor near the front door and the box in the bathroom (as this was the only spare power point near our bed! For the first night we put the pressure mat in the door way of the ‘sleep out’. We only did this the first night as after that my parents were sleeping in the sleep out. We also used our video baby monitor in her bedroom so we could check on her if we heard noises as night. We were able to deadlock a number of the doors, so I went out and got copies of the house keys made so that my parents and Aunty could have one each to have next to their beds at night in case of emergency! Lots of preparation. Lots of alarms and fail safes! Lots of blu-tack (to stick all the alarms up)! Luckily Chatterbox did lots of sleeping. We were able to enjoy our time away – spending time playing on the beach, relaxing and going on a bushwalk in the rainforest. Grumpy found this bottle of wine at our local bottle shop and had to buy it! 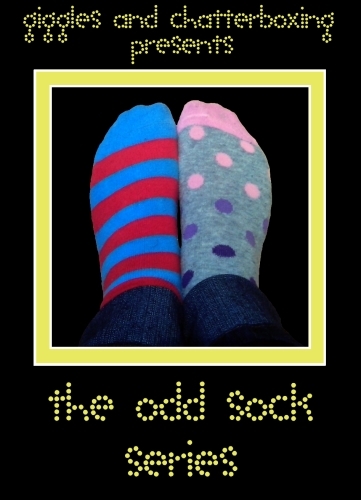 He had to buy it – I had to find something to do with it for my Odd Sock Series! 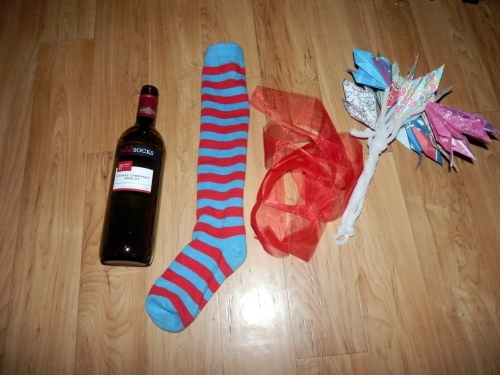 Thus I present… ‘The odd Sock Wine bottle vase decorated with an odd sock’ – or ‘wine bottle vase’ for short! Step 1: Pull the sock onto the bottle. Arrange it how you want it. Step 2 (optional): If you would like to you can tie the ribbon around the neck. I didn’t have the best ribbon – it would look nicer with a different type! Step 3: Fill with water. Step 4: Put in flower/s. Step 5: Enjoy your new vase! The wine bottle also looks good with a shorter sock – or a longer sock cut down as shown above. If you cut the sock it is easy enough to sew the cut section together to sit under the bottle. The review: I really like how this vase looks and it if very quick and easy to make if you need a vase for a flower or two. The vase obviously wouldn’t hold a lot of flowers and you need long-stemmed ones for this to work – but my favourite flowers are gerberas so that doesn’t bother me. I don’t drink wine, but if you do, you have a good excuse to buy a bottle! All in all I think this is a good use for those lonely Odd Socks. Battling with lots of red tape around here at the moment. Almost two weeks ago Chatterbox got prescribed Ritalin to help her ADHD. Because she is in foster care it’s not enough that the paediatrician thinks she needs it, we have to jump through hoops. FACS (Family and Community Services) has to approve her taking it. To do that we need a letter from the paediatrician, a form filled in by our case worker, and a behavioural management plan. This then needs to go to the manager of our fostering agency to get approved and then on to FACS to get approved by them. We knew that a behavioural management plan would be needed and I have been pushing to get one done since Chatterbox was diagnosed in December last year. It hasn’t happened yet and the earliest they can come out is next Tuesday – exactly two weeks after it was prescribed. Then it will have to be written up. The person doing it only works Monday to Wednesday so hopefully she gets it done by next Wednesday so our caseworker (who only works Wednesday to Friday) can send it off with her side of the paperwork. It is very frustrating!!! The Behaviour Management Plan will then need to be reviewed every three months! That’s not the only read tape either. We are hoping that Chatterbox will be moved to a special education support unit. The local schools have no vacancies but one is hoping to open up another class next year. To do so they need enough applications so that the Department of Education realises that there is a need for the class. Applications only get reviewed at certain times of the term – week 8 this term being one of those times. I talked to the principal at Chatterbox’s school at the beginning of this term about needing to get the application in as soon as possible. They agreed to have it ready by week 8 but asked me to remind them to add something specific to the application in week 7. I did that yesterday and the Principal said that she would make sure it was the right time and would get the application out, make a few changes and send it off. Today she told me that it would be in by week two of next term! Completely not what we wanted or what was needed. What is so frustrating about both situations is that even though we try and get things done, we just have no say and can’t really do anything about it! 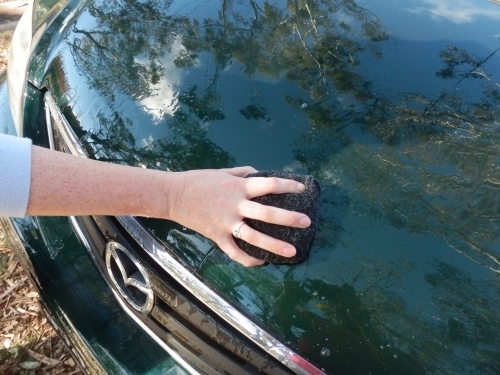 It’s a sunny day, the car is dirty, you have some free time to wash it – then you realise you don’t have a sponge to use. What do you do? Well – you know those odd socks you have? Did you realise that they make excellent ‘sponges’ to clean the car? This is one I have been doing for a while – before I started the series. I tried out two options for ‘making’ the ‘sponge’. I preferred one method and Grumpy preferred the other so I suggest that you try them both for yourself. and a number of odd socks. Step 1: Option 1 – take two thick socks and roll them up to make a ball. 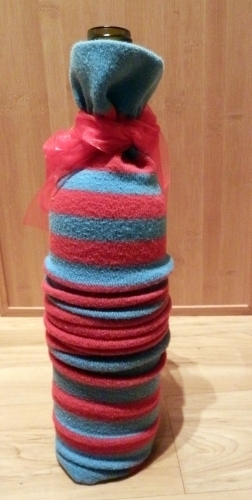 Option 2 – stuff a number of balled up socks inside another sock. 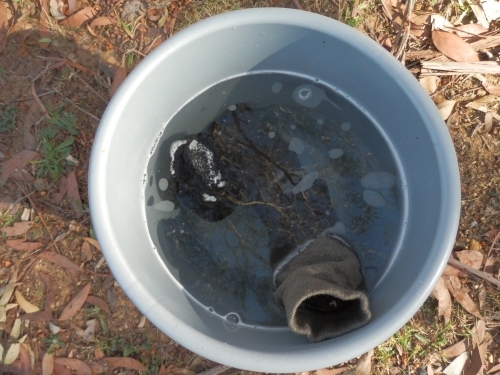 Step 2: Prepare your bucket and water. Chuck the socks in to get thoroughly wet. Step 4: Enjoy having a clean car while knowing that you recycled the materials rather than using a new product. 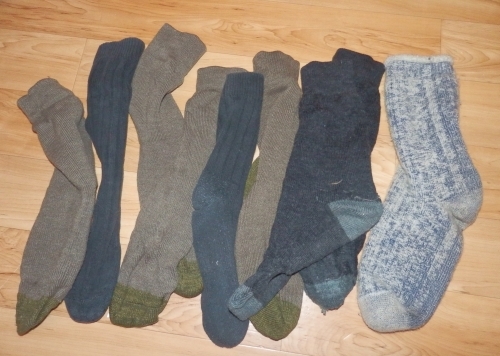 The best part – you can chuck the socks in the wash and use them again and again. 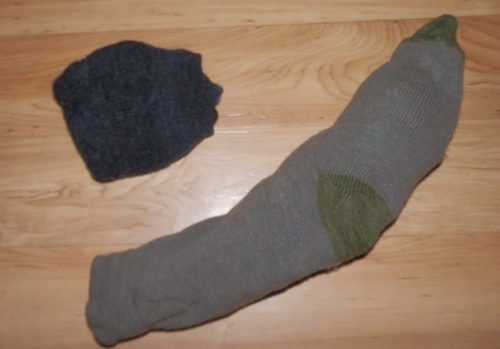 The review: Option 1 uses less socks but I found that option 2 (when folded over as shown in the photo below) was easier to handle and it cleaned a larger area so was quicker (always a plus in my book). Grumpy preferred option 1 as he found it easier to hold – possibly because his hands are bigger. As I said earlier, I suggest trying both and seeing which you prefer. 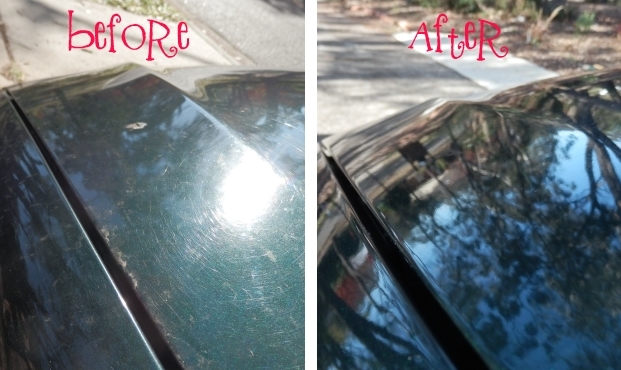 Either way, the car was nice and clean – just as clean as when using a shop bought sponge. Before I start I have to apologise for my lack of posts lately. I have been busy finishing off a 3000 words assignment for uni that was due yesterday – handed it in with 50 minutes to spare! My semester is now finished – just in time for Gotcha Day! I have done a post on Parents Space about why we call it Gotcha Day, will post the link when it goes up. Two years ago today I was counting down the hours until the kids moved in. It seems like it was only yesterday, and like it has been forever at the same time. I can’t imagine not having the kids in our lives. Tonight we will celebrate the day we became a family. We will be having a nice dinner out and we buy the kids a present. Grumpy and I are so happy the kids live with us and we tell them that every day. We have also made sure that they know they are here forever. However, on Monday we were explaining how many ‘sleeps’ it was until Gotcha Day and Chatterbox piped up with “and then I’ll be moving to another house?”. I’m fairly sure that Giggles doesn’t remember living anywhere other than here. Chatterbox, however, has an amazing memory and remembers living with birth family, and most likely the moves between the four foster homes they have been in (including ours). I wonder how many years it will be before she feels completely secure in the knowledge that she is stuck with us. For now we will continue showering her with our love and telling her constantly that she is not moving. And today we will celebrate our Gotcha Day! Hands cold? 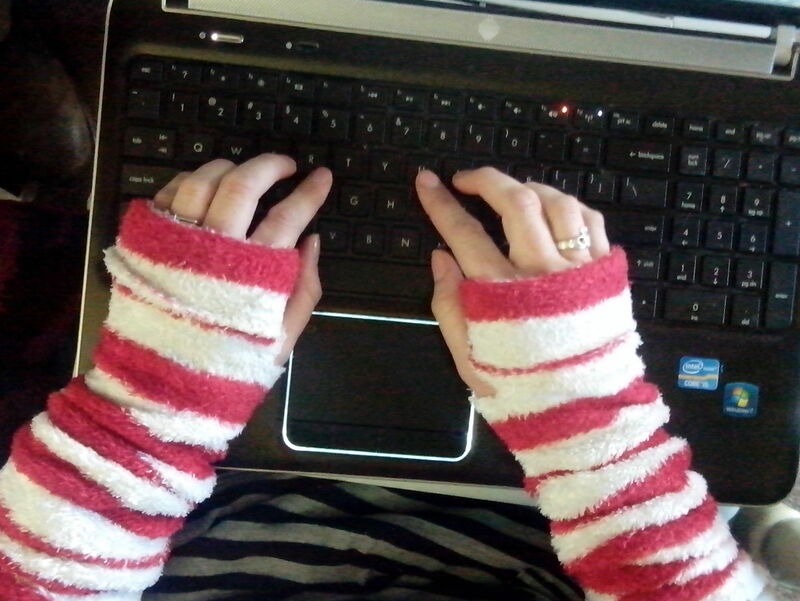 Have your gloves but want your fingers free to type? Can’t find your gloves or mittens? Never fear! Odd Socks Mummy is here with my Odd Sock Series. Today I bring you Odd Sock Mittens – and I promise you they are so quick and easy you can make a pair and your hands will be warming up in minutes! What you need: Socks (odd or not) that fit on your hands; scissors. That’s it! See I told you that they are easy! Step 1: Cut the foot off the sock just above the heel. 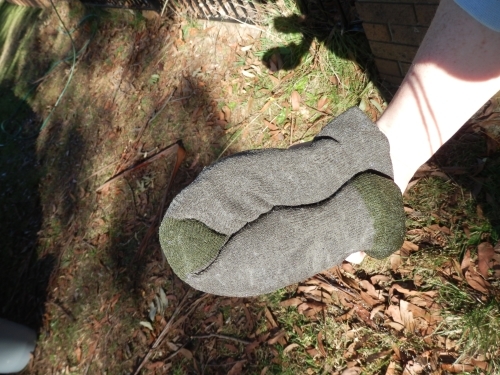 Step 2: Put the sock on your hand and work out where you want the thumb hole to go – remember the spot! I was able to easily do this as my socks were stripy. If your socks are harder to see then use something to mark them. Step 3: Cut a small slit for your thumb to go through. Remember that you can always make the hole bigger but not smaller so start with a little cut! It is deceptive how small a cut you can make and it will fit! Step 4: Try them on and adjust the thumb hole if needed. Step 5: Enjoy your new mittens and having toasty warm hands! These mittens are so comfy and warm that I’ve barely taken them off! My favourites are my “Cat in the Hat” ones – red and white stripes. 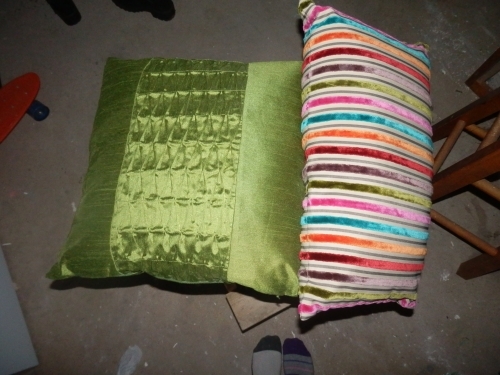 They are made out of soft and fully material and thus they are really, really, really comfy. This isn’t to say that the others aren’t comfy but just that the red and white ones are extra comfy. If you make some, please let me know how you go.